Эта статья есть на русском языке. 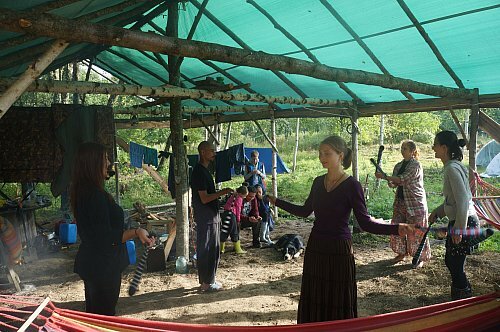 Chistoe Nebo camping is a free camping site in Chistoe Nebo ecovillage. It has a rain shed with a fire place, electricity, wi-fi, water, simple kitchen, toilet. In the host house there's shower and a washing machine. There are some spare tents and sleeping bags, but you should really bring your own ones unless you communicate this with the owners. 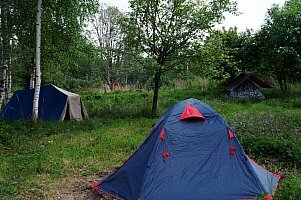 The camping works from April until September. You can come and stay there for free for as long as you want, look around, meet locals, etc. Simple vegetarian food is available, 3 meals a day — also for free, but you're welcome to make a donation. 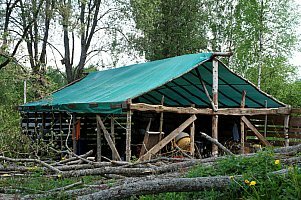 You could also help the hosts with their daily stuff in exchange for shelter and food, much like WWOOF or Workaway; the work is usually related to construction, gardening, goat keeping, plant nursery.